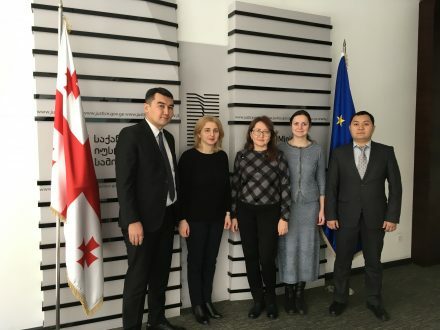 Earlier this month, PRI’s South Caucasus and Central Asia offices organised for a delegation from Kazakhstan to visit Georgia to learn about the country’s good practice examples in the fields of child protection, welfare and justice. The delegation visited children’s rehabilitation facilities, low-risk facilities, foster homes, and family homes for homeless children and children with disabilities, in order to learn about juvenile crime prevention; inter-agency coordination; diversion, mediation and alternatives for children; the specialisation of professionals engaged with children; and rehabilitation programmes for children. Meetings were held with UNICEF and Georgian NGOs that work with children, as well as with the Ministry of Justice; the Ministry of Labour, Healthcare and Social Security; the Chief Prosecutor’s Office; and the Police Academy. 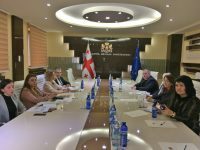 The delegation consisted of representatives from Kazakhstan’s Ministry of Education Committee for the Protection of Children’s Rights, the penitentiary service, the General Prosecutor’s Office, and the police. PRI advocates for child-friendly justice systems and publishes resources for policymakers, prison authorities, judges, members of inspection committees, prison staff, and social and probation workers who work with children in contact with the law. Click here to read our 10-point Plan for Fair and Effective Criminal Justice for Children. Main image: delegates at the Ministry of Justice. Inset image: meeting at the Ministry of Corrections.